Take the worry of watering off your mind by allowing Wharton’s Landscaping to install an automatic sprinkler system. Irrigation systems are the most convenient and efficient way to ensure your landscape receives the water it needs without over-or-under watering. Wharton’s uses Rain Bird products to ensure our customers have the best quality, value and performance for their irrigation system. 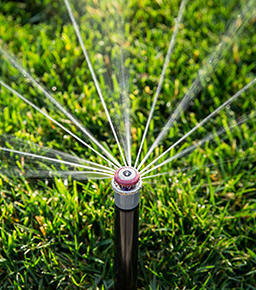 We also offer spring start up and winterization for your irrigation system plus provides repairs. So begin enjoying greener grass, healthier plants and more free time thanks to your automatic sprinkler system! Contact us now for a free estimate!